BBC NEWS | Programmes | Politics Show | South West: Flying the flag? South West: Flying the flag? 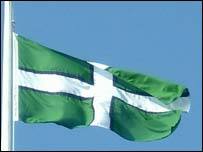 A Cornish MP is campaigning for the flags of Devon and Cornwall to be given the same rights as national flags. Under current legislation national flags are exempt from planning control, but the same exemption does not apply to local or regional flags. Paul Tyler, MP for North Cornwall said: "It seems that a loyal citizen of Albania or Zimbabwe, living in Cornwall, would be allowed to raise their national flag on a flagpole without first getting planning consent, but anyone who was proud to be Cornish could not fly the flag of St Piran. Mr Tyler added: "Who says that St George of England is more saintly than St Piran of Cornwall and why should there be any difference in official advertising controls anyway?" The issue came to a head for Rodney Lock, from Ottery St Mary in East Devon. He put up a Devon flag in his garden last February, but after a complaint was made, he received a visit from East Devon District Council. Mr Lock was told be if he failed to put in a planning application he would be breaking the law and could risk court action. He said: "It was Sunday morning I put up the flag and worked hard, digging the flag pole and putting in concrete, it was fantastic to wind the flag up. "And then three days later, council was on the door step. I was very angry, because I have lived in Devon all my life and I was just proud to live in this area." But East Devon District Council said that it had very little choice and was forced to take action. The Head of Planning and Countryside services for East Devon District Council, Kate Little said: "Once you've got a complaint, you've got a duty to the complainant, to follow through. "If nobody complains, then probably we would not take much action in relation to it, we would just look the other way". We approached the government Minister for Housing and Planning, Keith Hill for a comment about the issue, but he was not available. Meanwhile, North Cornwall's MP, Paul Tyler is lobbying for a change in the law. Mr Tyler said: "This pick-and-choose attitude makes for an impossible task for local Council Planning Officers. Are they really meant to drive round the district checking for which flags are flying?" As for Rodney Lock, after six months of paper work the council eventually decided not to take any further action. He is still flying his flag, even though officially it is illegal to do so. The Politics Show wants to hear from you. Let us know what you think. That is the Politics Show, Sunday, 05 December, 2004 at 12.30pm. Join Sophie Long and Chris Rogers for The Politics Show on BBC One on Sundays at 12.30pm.